Eminem has said he shaved a few years off his life because of his past drug taking. The hip-hop star opened up about his dark days in an interview with Rolling Stone magazine. "I'm as happy as I can be, I guess," the 41-year-old said. "Hip-hop saved my life, man. It's the only thing I've ever been even decent at. I don't know how to do anything else. I think they have a word for that - what do they call it? Idiot savant?" 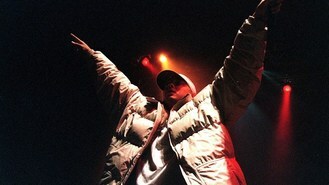 The Slim Shady singer, now clean, has previously admitted ending up in hospital in 2005 following a methadone overdose. "I relapsed on drugs. It was a little creepy. I certainly had some dark times with that s***, mostly due to taking a lot of pills and f***ing drooling on myself. It was a s***** time," the star, real name Marshall Mathers, said. "I know I probably shaved a few years off my life," the Daily Mail quoted the singer, who is enjoying success with his recent single The Monster , as saying. James Arthur has been diagnosed with "acute exhaustion" and cancelled all engagements while he recovers - just days after being embroiled in a homophobia row. Matthew Morrison has revealed he covered the recording studio with Christmas decorations when he made his festive mini-album - in March. Oritse Williams has revealed people warned him that JLS would be "a waste of time". Lady Gaga has revealed she can't understand the "overflow of hate" that she receives. Gary Barlow has revealed he is enjoying the music-making process this time around, as he prepares to release his new album. Noel Gallagher has rubbished rumours of an Oasis reunion, saying he would not be involved. Wu-Tang Clan leader RZA has said he thinks the group's next album will be their last in their current form - but he's still waiting for Raekwon to turn in his verses. Rapper Wiz Khalifa has told how he ended up collaborating with Adele for a new track after she complimented his wife. Robbie Williams has told how he poured his feelings about his daughter into his new song.